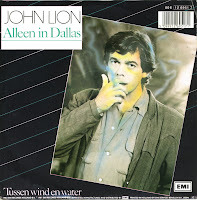 When John Lion sings 'Alleen in Dallas' ('Only in Dallas'), he isn't referring to the city in Texas, but rather the television series that was immensely popular in the Eighties. His encounter with a woman in a bar who turns out to have a big and rather aggressive boyfriend is apparently something that could only happen in a fictional television series. The single was originally released in 1983, but failed to chart. I bought the single in 1988, when it was re-released. And again, the single failed to chart.